In this article I am going to write about this one photo, how I chose this location, how I got there, what gear I used, the camera settings and also how to get away with going out in the middle of the night to take photos when you are on a family holiday! Along with a number of other frivolous bits of information. Photography is meant to be enjoyed after all. And I love travel photography. 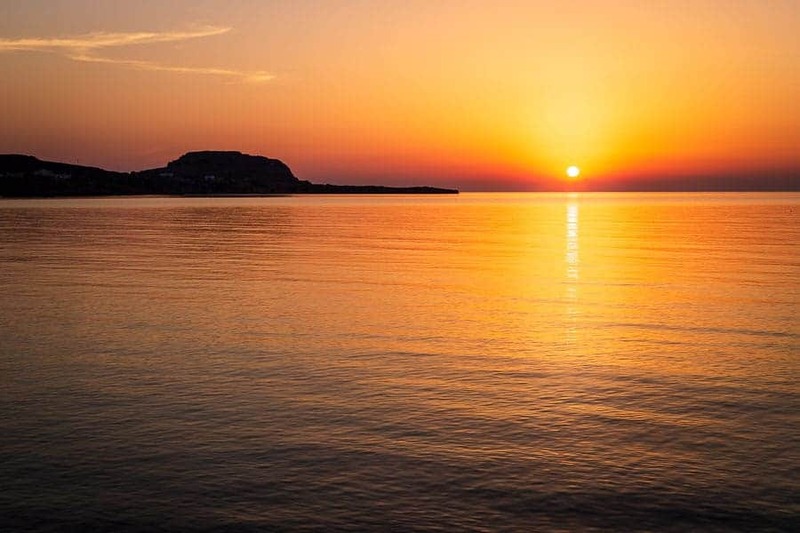 Navarone Bay on the lovely Greek Island of Rhodes. Navarone Bay is one of my favourite locations on this lovely island. 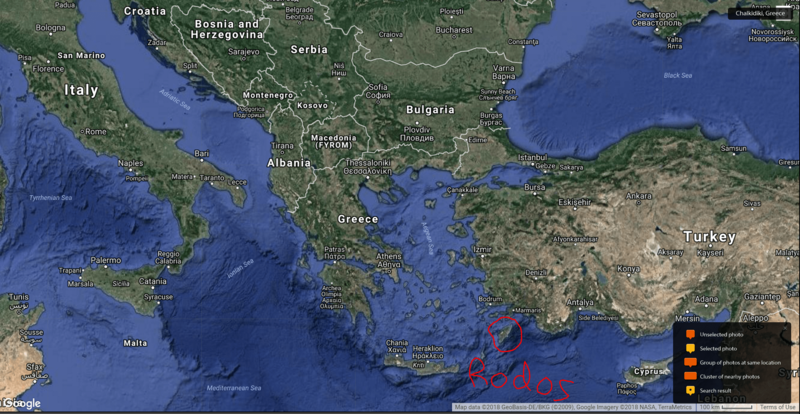 Rodos is the local spelling of Rhodes. And it was at this point that I realised I had forgotten to turn on my GPS – that it is not working on my Canon 6D. This is where I took the photo from. 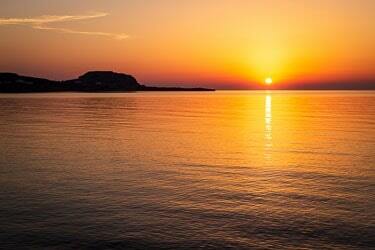 Rhodes is one of the Dodecanese Islands, and is located on both the Aegean and Mediterranean seas. 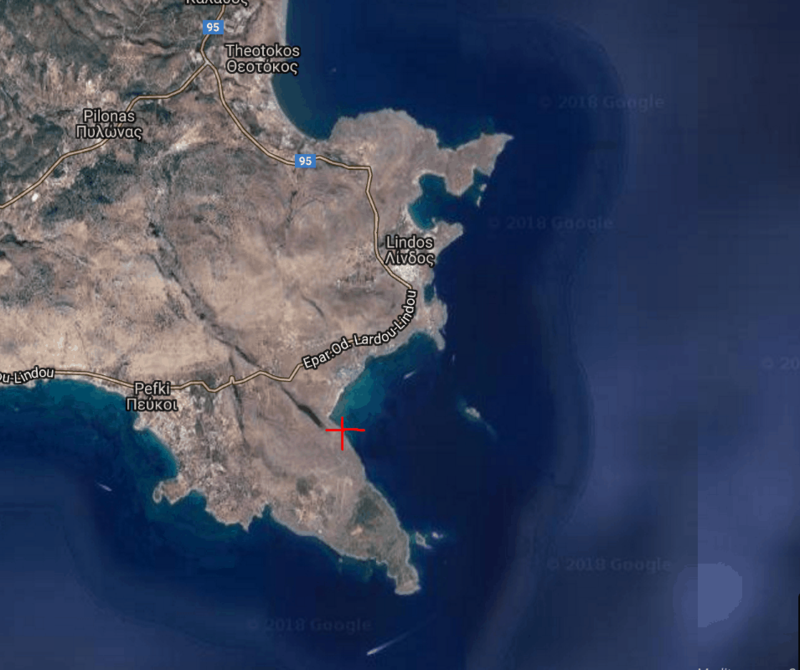 There is actually a place where the two seas meet called Prasonisi which is a great place to visit (new power station apart). This is one of my favourite stretches of road too, with those cliffs and the lovely, crystal clear aquamarine water in the bay. I have been to Rhodes many times, and know this area very well. I have photographed various locations, but never this location at sunrise. So on this trip that is what I decided to do. I am getting much better at sticking to plans these days – I find I get things done and get them done better than I used to. As I knew the location pretty well I knew where the sun would be rising, and I knew the composition I was after. What was I looking to photograph? If you look at the image, the raised bit of land is actually the rocks on which the Acropolis of Rhodes sits. This is a much-photographed location – I like to include this iconic Greek landmark in photos but in a different way. I wanted to capture the Acropolis in silhouette, with the rising sun off to the right. And also capture some of those lovely, gentle lapping morning ripples on the surface of the sea. These are this lovely waves in this video. With all this knowledge of the location getting to where I needed to be was nice and easy. I knew where the sun was going to rise, so I placed myself where the Acropolis and sun would be aligned in accordance with the good old rule of thirds. 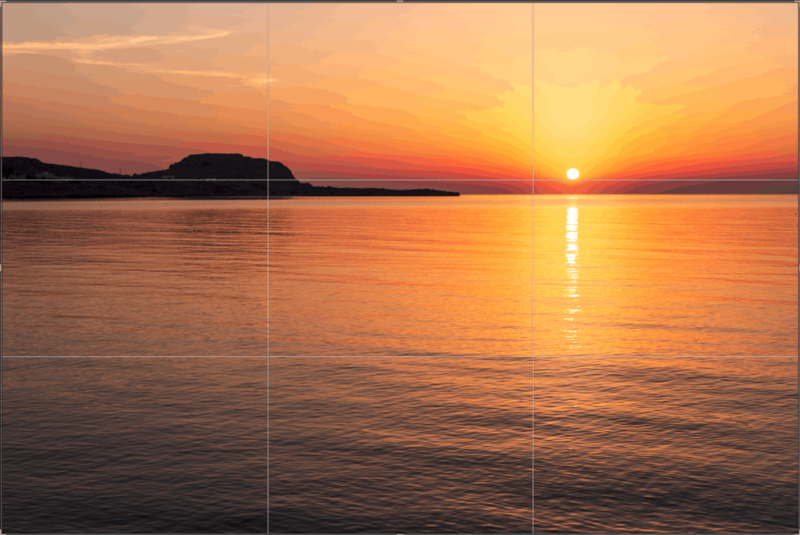 Here is the photo with the grid overlay – I didn’t do a bad job? This is all the gear I took for a two-week holiday. Camera body, lens, memory cards, tripod, batteries and charger get transported in my Peak Design backpack, everything else goes in plastic boxes which go in the checked luggage. This genuinely is all I take, and I used pretty much everything at some point during the two weeks. I like travelling light, and enjoy restricting myself to this minimal gear. I am looking forward to having a smaller camera one day to reduce the bulk even more, but that is a subject for another time. And this is the gear that I took with me that morning. 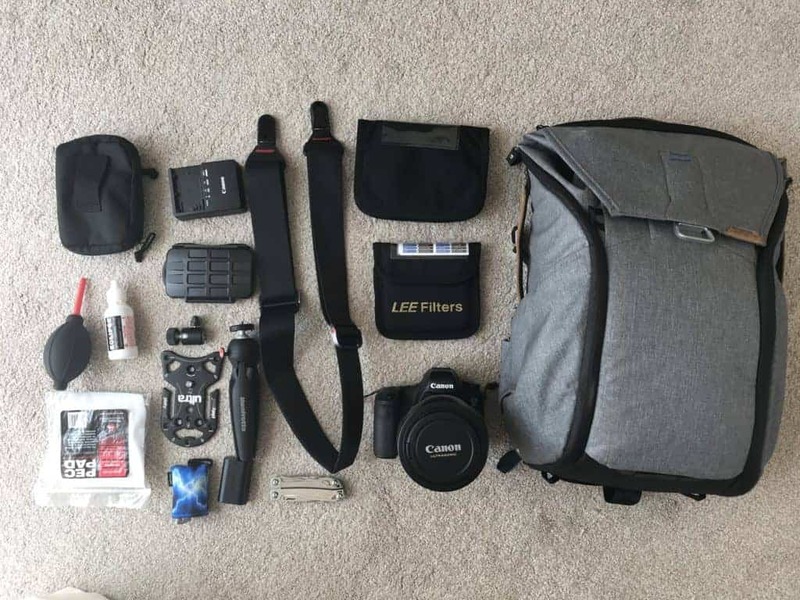 I had plenty of space in my bag as the Peak Design Everyday Backpack is such a versatile bag – even somewhere to attach car keys to and a side pocket for my drink. I managed to clamber over the rocks with both hands free to help me navigate the terrain to my location of choice. I haven’t got much gear with me. Setting up my camera is basically fixing that tiny Manfrotto tripod onto the base of my camera. Yes, I manage with a Manfrotto Pixi, leaving my full sized tripod at home. 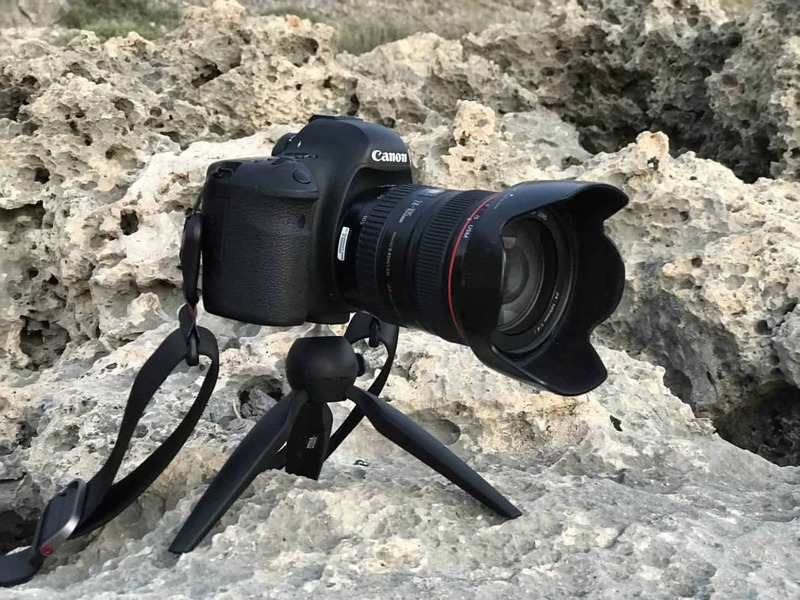 I place the tripod on a rock in such a position as I can get to the back of the camera, and compose using Live View. I focus 2/3rds of the way into the composition using back-button focus. And then I use the 10 second self-timer to take the photos. 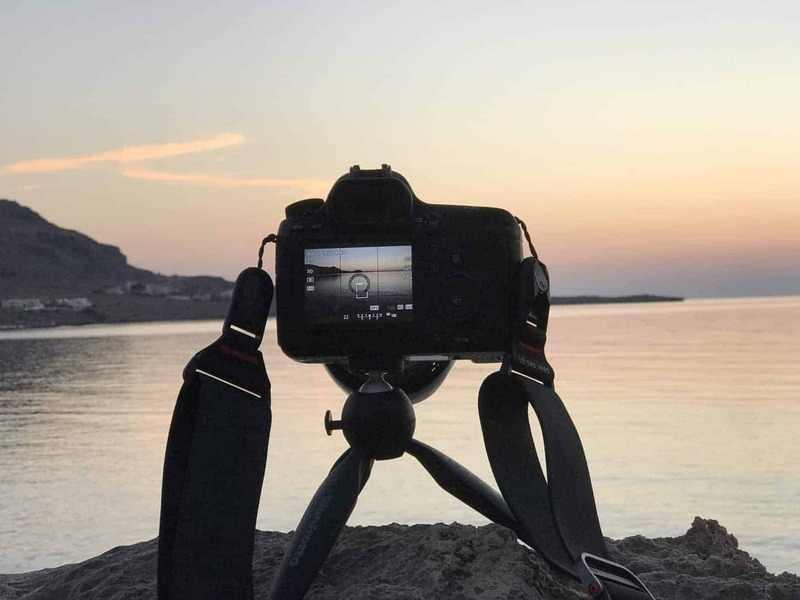 Once I have my camera set up and where I want it I leave it until the sunrise has happened – I am only trying to get that one shot. I love this bit. Once I have my camera ready to take photos, I can relax and enjoy the moment. From where I was sat on the rocks, the only sound was the very gentle lapping of the waves right below me. It is my special quiet place. I love that period of time waiting for the sun to appear. I do of course take videos and photos using my iPhone whilst I am waiting, capturing my location, the views, camera, gear and shoes. Here is one of those videos. And have a drink if there is anything left. And a snack if I remember to grab some goodies from the fridge! What it looks like where I took the photo from? This is the view looking back to where I took the photo from. As everything is set up it is just a question of waiting, and gently pressing the shutter to start the self-timer to capture the sun making its appearance. For the first time I have had a go at taking videos with my Canon 6D. I am still happy with the videos I get from my iPhone, which I know are pretty basic and point and shoot standard at the moment. The iPhone does produce decent quality 4k video, and of course being an iPhone publishing these videos is very very easy. 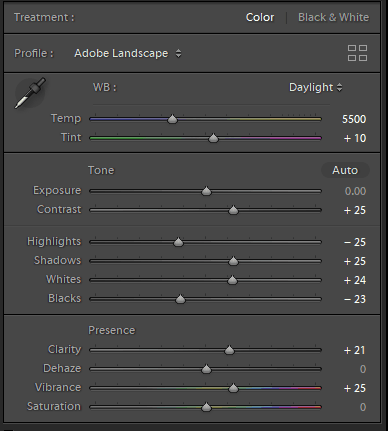 I apply some develop settings when I import images into Lightroom. For this image, I first had to creat a new image from the bracketed exposures, which I did using the HDR Merge tool in Lightroom. This is a very powerful, and effective tool. And at this point I want to answer the question that some of you are thinking of asking – is there any point doing an HDR image of this scene? Here is the answer – check out the two images below – can you tell which is the HDR image and which is the first image capture? Both have had exactly the same processing carried out to them in Lightroom. I will let you answer that question in the comments box – is the HDR image the top or bottom one? I said I was all alone. Not quite. I had this fella for company. 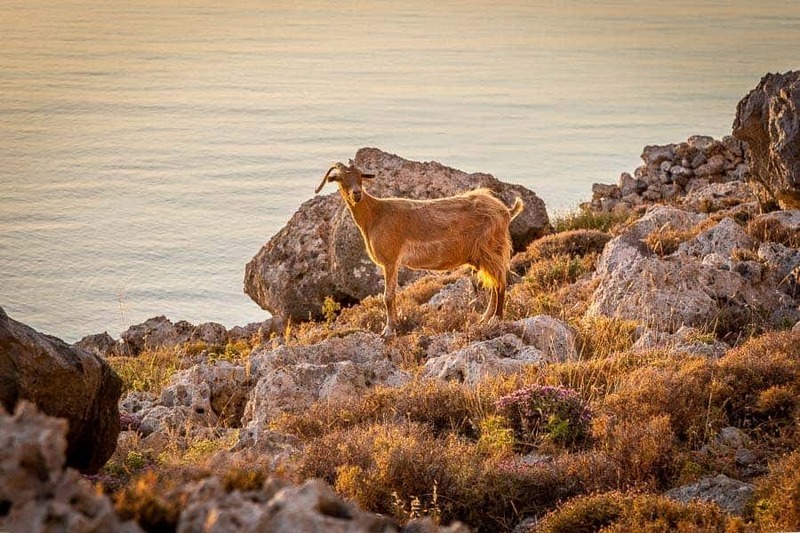 Apart from him not a sound to be heard anywhere, until the donkeys in Lindos woke up for breakfast! These are the donkey taxis that take people from the main square in Lindos to the entrance to the Acropolis. A can of Pepsi Max – that is all I had. I really should prepare something orange squash like – Pepsi at 5am is just not that great! It is far too sweet, gassy and not the kind of refreshment I need at that time of day! I wrote a previous article about my photographic trip to Santorini, which you can read here. I mentioned my red pumps – that was all I had (bar flip flops) to put on my feet. I made the same mistake again – travelling light is fine but travelling too light can be an issue. 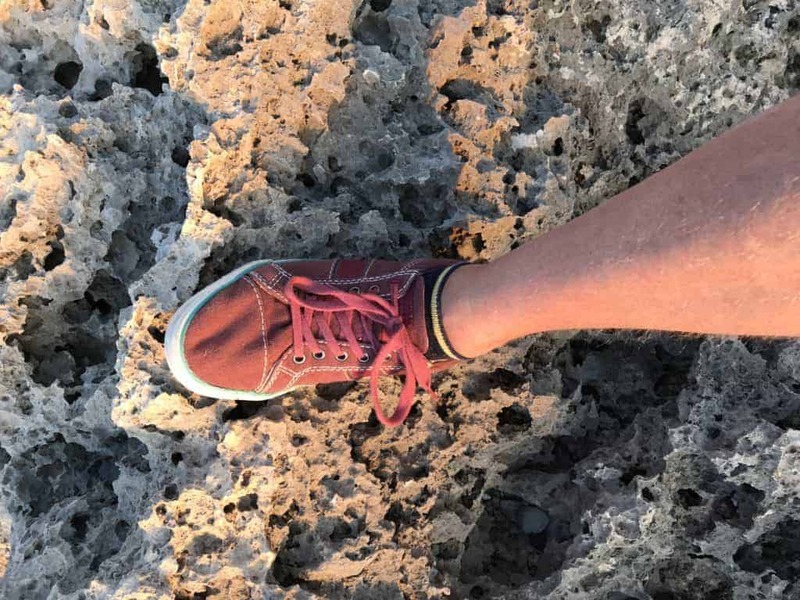 They are not great for clambering over sharp volcanic rocks it has to be said. 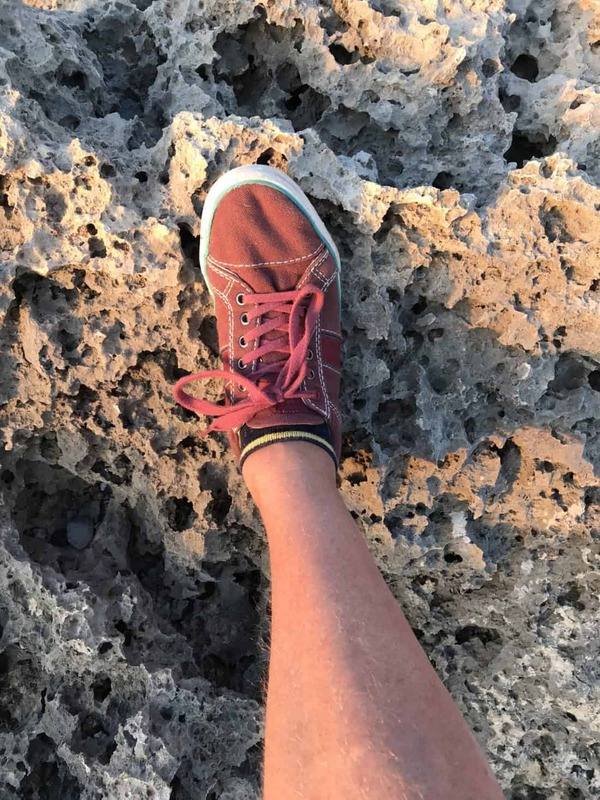 So think about your footwear before you go on a trip! I am going to get some really light walking shoes which I can chuck in my suitcase before my next trip. To compound my lack of preparedness I wore shorts. I keep on forgetting how sharp and uncomfortable those rocks are that I am clambering over. And the problem is made even worse by the fact that I am using a Manfrotto Pixi, which is so small all I can do is place it on the ground and then lie down to see what my screen is showing me. But to be fair it is so hot in May at sunrise that I just put up with the injuries! I obviously set an alarm for some hideous time in the morning. I don’t complain because no one is asking me to do this – this is all my own doing so no sympathy expected or deserved. I pack my bag the night before, and leave everything else that I need to hand. Car keys, sunglasses, money on the off chance of there ever being anywhere open at that time in the morning. I make sure that the batteries are all charged of course, and that my memory cards are organised how I want them. I leave the Pepsi in the fridge. You are on a family holiday, but you want to take dome photos. This is how I get away with it. I did not take any photos for the first week apart from when we went on family trips out. Pack a bag the night before – wake up the family at 4am and they will be less tolerant to future early rising. 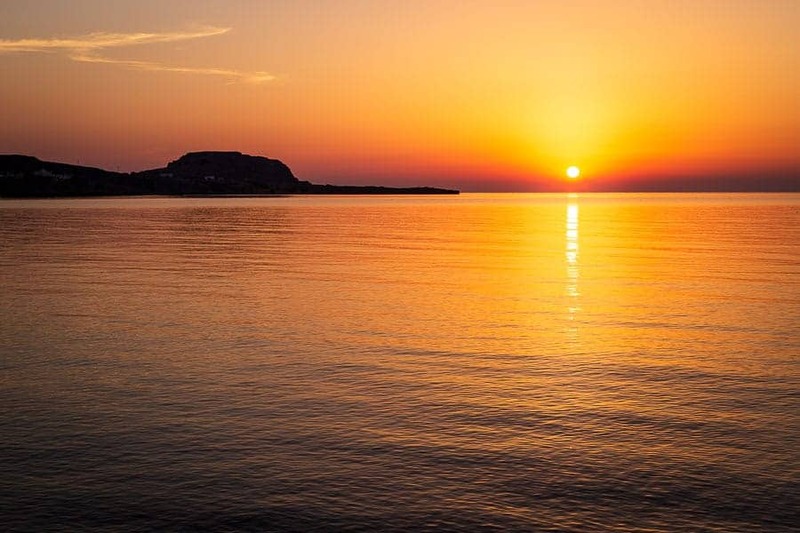 I did go on to Lindos after the sunrise had happened, and got some other shots that I wanted, but I was home by 8am to find everone still in bed and sound asleep. I got up at 4am. I have lost four hours sleep. I have to live with that lack of sleep, and not let it make me grumpy and irritatble. We are on holiday after all! This is now much I enjoy photography. I live and breathe it day in day out. And it is my favourite me thing to do when I am on holiday – it is the thing that I choose to do for myself. I would love to hear your questions, comments and thoughts – please add them in the comments box at the bottom of this article.